Under general anaesthetic, the donor kidney is removed by an operation in the same way as if the kidney was diseased. Most surgeons remove the kidney through an incision in the side, other surgeons prefer to remove the kidney through an abdominal incision. The kidney is located at the back wall of the abdomen behind the bowel and the stomach. 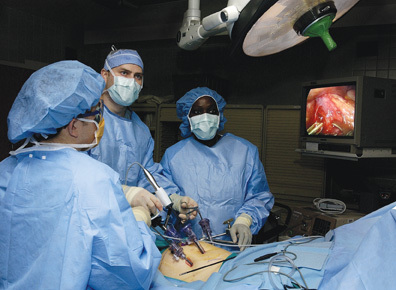 Generally, for purposes of living kidney donation, the surgeon chooses to remove the left kidney as it has slightly longer blood vessels, which facilitate the transplant. Sometimes kidneys have more than one blood vessel, or there may be a slight discrepancy in the size of the kidney, and, therefore, the right kidney might be best removed. The donor is always left with the “best kidney” of the two. If the left kidney is to be removed, the bowel is first put to one side out of the way and then the fat around the kidney is cleared away. The kidney is mobilised and the artery, vein and ureter (drainage urine tube) are identified and dissected free. Neighbouring structures to the left kidney are the spleen, the adrenal gland, the pancreas, the colon and small bowel and the stomach. Neighbouring structures to the right kidney are the liver, the adrenal gland, the inferior vena cava (a very large vein) and the bowel. The surgeon takes great care not to inadvertently injure any of these adjacent structures as they free up the kidney. They will then divide the ureter to go with the donor kidney. The artery, bringing blood to the kidney, comes off the main artery of the body - the aorta. The donor kidney vein comes off the main vein in the body - the inferior vena cava. When the blood vessels are clearly identified and dissected, to give maximum length by dividing any branches not supplying the kidney, the surgeon first secures the artery, either by tying it off or stapling it shut. The vein is then tied off in a similar fashion and the donor kidney is removed. Once the artery is tied off, the kidney is removed as quickly as possible, as the blood in the kidney can clot while it is not circulating. Once the kidney is removed, the surgeon checks that there are no areas of bleeding and then closes the wound. Depending on the donor’s anatomy and preference and the surgeon’s decision, the surgery might be performed through an incision below the ribs or by a ‘keyhole’ incision. The advantage of the keyhole incision is that it allows the incision to remove the kidney to be sited lower down in the abdomen, which is generally not as sore post-operatively. This incision also allows the surgeon to place their hand into the abdomen to facilitate the dissection of the kidney. However, if the keyhole method is adopted and the surgeon has to convert to the traditional open surgical method, for whatever reason, then the donor will have the standard scar below the ribs and a second scar lower down on the abdomen. The surgeon’s first priority is always to ensure the safety of the living donor. The kidney is lifted out of the wound and flushed with a cold solution to wash out blood and slow the metabolism before being carried into the adjacent operating theatre in which the recipient is waiting. 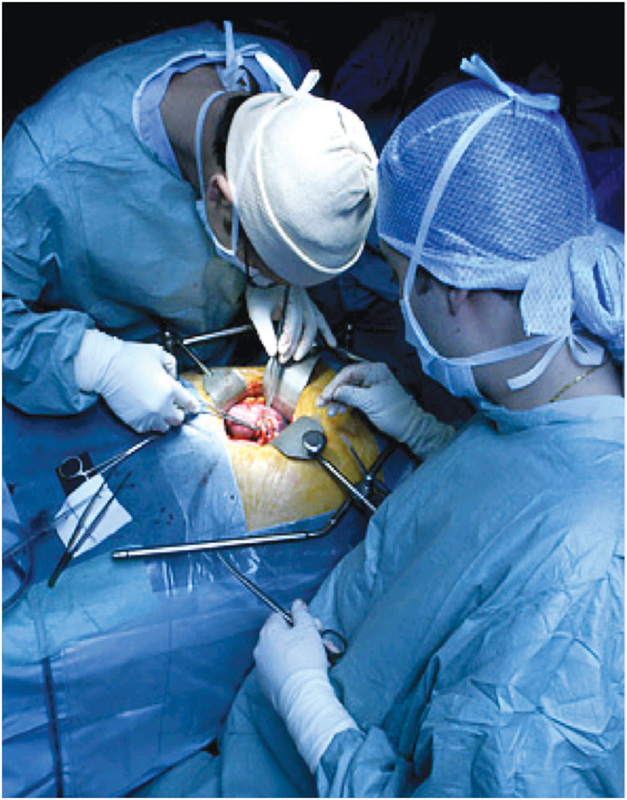 The incision(s) is/are then sewn up and the donor is transferred to the recovery room and, subsequently, the ward. Sometimes a temporary drain is fitted near the wound. Fluids can be administered via a drip, and because the incision can be painful afterwards, infusions of pain killers can be added to this. Alternatively, the anaesthetist may insert an epidual catheter to administer medication close to the spinal cord to help with post-operative pain. This is usually removed on the second or third day post-operatively. A catheter is inserted in the bladder. Tubes are usually removed, after the first day, and the donor is encouraged to get up and sit in a chair. 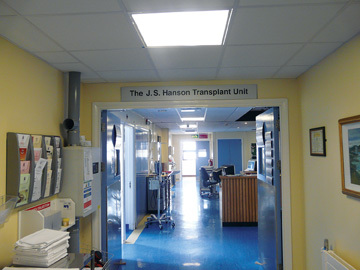 A donor’s stay in hospital is usually between 5 and 10 days. He or she can expect to be out of bed the day after the operation and home in less than two weeks. The stitches are removed approximately 10 days post-surgery. The wound may remain sensitive for several weeks. Sometimes a small area of numbness may be noticed on the skin of the abdomen, because small nerves have been cut by the incision at the side. However, the scar should be the only permanent reminder of the donor operation. The donor will have to take 8-12 weeks off from work to recuperate, depending on the individual and his or her occupation.